Lucien Pissarro, London (by descent from the artist, 1904). Arthur Tooth & Sons, Ltd., London (acquired from the above). Mrs. V.H. Deuchar (acquired from the above, October 1947). Sam Salz, Inc., New York (acquired from the above, May 1952). Mr. and Mrs. Leigh B. Block, Chicago (acquired from the above, May 1952 and at least until 1978). Mr. and Mrs. Sigmund A. Rolat, New York; sale, Sotheby's, New York, 17 May 1990, lot 2. Galerie Urban, Paris (until 1993). William Vareika Fine Arts, Ltd., Newport, Rhode Island. Acquired from the above by the present owners, 3 March 2008. Stockport Express, 7 January 1932. The Rochdale Observer, 29 October 1932. L.R. Pissarro and L. Venturi, Camille Pissarro, son art--son oeuvre, Paris, 1939, vol. I, p. 130, no. 356 (illustrated, vol. II, pl. 71). R.R. Brettell, Pissarro and Pontoise: The Painter in a Landscape, New Haven, 1990, pp. 93-95 (illustrated, p. 95, fig. 86). J. Pissarro and C. Durand-Ruel Snollaerts, Pissarro: Catalogue critique des peintures, Paris, 2005, vol. II, p. 329, no. 456 (illustrated in color). London, Strafford Gallery, Pictures by Camille Pissarro, October 1911, no. 30. (possibly) London, The Doré Galleries, Post-Impressionist and Futurist Exhibition, 1913, no. 6. London, National Gallery, Oil Paintings by Camille Pissarro, June-October 1931, no. 34. Birmingham, City Museum and Art Gallery, Oil Paintings by Camille Pissarro, October-November 1931, no. 28. Nottingham Castle Museum and Art Gallery, Oil Paintings by Camille Pissarro, November-December 1931, no. 14. Stockport, War Memorial Buildings and Sheffield, Mappin Art Gallery, Paintings by Camille Pissarro, January-March 1932, no. 13. Bootle Museum, Oil Paintings by Camille Pissarro, April-May 1932, no. 12. Leeds City Art Gallery, Paintings by Camille Pissarro, July 1932, no. 31. Northampton, Art Gallery; Blackpool, Grundy Art Gallery and Rochdale Corporation Art Gallery, Paintings by Camille Pissarro, September-November 1932, no. 26. London, The Stafford Gallery, Constable, Bonington, C. Pissarro, May-June 1939, no. 18. The Art Institute of Chicago, Treasures of Chicago Collectors, April-May 1961. Washington, D.C., National Gallery of Art; Los Angeles County Museum of Art and Boston, Museum of Fine Arts, 100 European Paintings and Drawings from the Collection of Mr. and Mrs. Leigh B. Block, May-June 1967 and February-April 1968, no. 4 (illustrated). Santa Barbara Museum of Art, Impressionist and Post-Impressionist Paintings from a Private Collection, 1978 (titled Riverbank at Pontoise). Akashi, Cultural Center; Nara Sogo Museum of Art; Fukuoka Prefectural Museum of Art and Kanagawa, Sogo Museum of Art, Les Impressionnistes et l'art moderne: de Monet à Picasso, October 1997-April 1998, no. 17. Fort Lauderdale, Museum of Art, Impressionism to the Present: Camille Pissarro and His Descendants, January-April 2000, p. 53, no. 22 (illustrated in color). In 1873, the landscape of Pontoise was substantially altered by the construction of a large factory, Chalon et Cie., directly across the Oise river from the Hermitage quarter where Pissarro and his family lived. 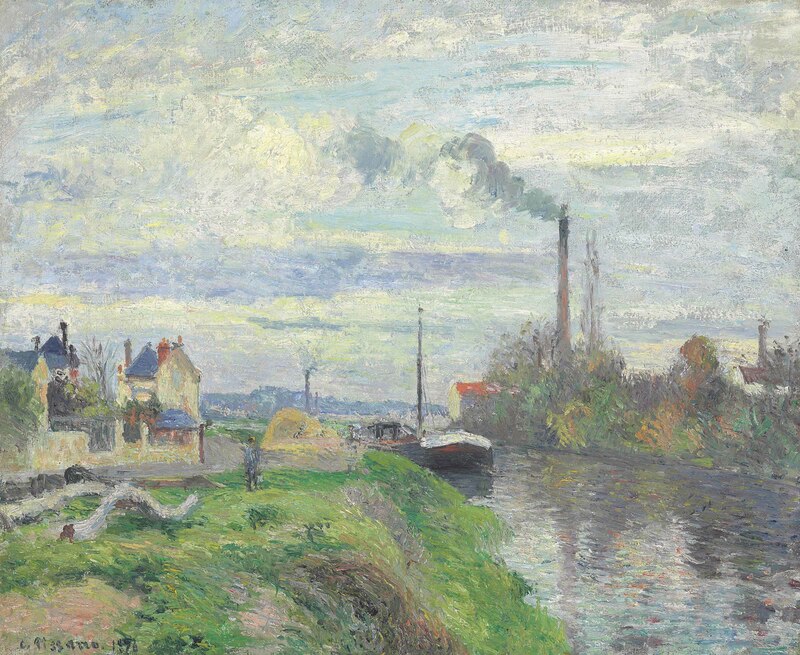 In response to this development, which gave this stretch of the river an industrial character for the first time, Pissarro painted a series of four canvases that prominently featured the vast new usine (Pissarro and Durand-Ruel Snollaerts, nos. 297-300). In 1876, after concentrating exclusively on rural imagery for two years, the artist returned to the motif of the factory, producing Le quai du Pothuis à Pontoise and four closely related views (Pissarro and Durand-Ruel Snollaerts, nos. 454-458). Yet there was an important distinction between the two series: "In contrast to the pictures of 1873, Pissarro placed himself in such a position that the prominent foliage of the Ile du Pothius actually screens the factory buildings from view," Richard Brettell has explained. "The pictures represent in this way a contextual rejection of a once-powerful object. The factory is designified by its setting" (op. cit., 1990, pp. 94-95). Pontoise, as the name implies, lies in a commanding position on the banks of the Oise, at the edge of the Vexin plateau nineteen miles northwest of Paris. Pissarro had lived at Pontoise between October 1866 and January 1869, and he returned in April 1872, shortly before construction on the Chalon et Cie. factory began. The ensuing decade that the artist spent at Pontoise was one of the most prolific periods in his career, during which he fully developed his Impressionist technique. His sustained focus on Pontoise and its environs resulted in over three hundred paintings and represents the most enduring portrait of a particular locale by any French painter during the Impressionist period. Pissarro painted Le quai du Pothuis from the left bank of the Oise, looking upstream. From this position, once again, the foliage of the Ile du Pothuis largely obscures the view of the Chalon et Cie. factory. The left half of the composition is given over to the depiction of the rural enclave of L'Hermitage, which largely retained its traditional agrarian character in the artist's day. Ivory colored houses are topped with vibrant blue roofs, and the green riverbank slopes downward to the water's edge. A single figure stands on the bank gazing at the flowing river, with its colorful play of reflections. Within this homage to rural solitude, however, there are inescapable signs of modernity. Emerging around the corner of the bank and moving toward the viewer is a barge, of the sort that carried the regional grain harvest down the Oise to the Seine and on to Paris. The factory's smokestack, moreover, maintains a strong linear presence in the painting's composition, echoed by the mast of the barge and another smokestack in the distance. Plumes of smoke emitted from the factory sweep through the picture's sky, which is painted in gestural swirls.